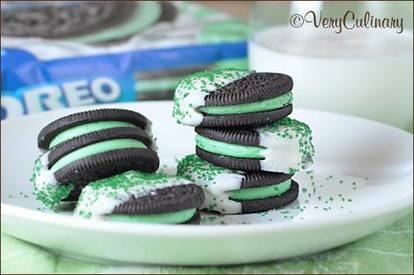 Since Oreos sort of rule my life, it’s only appropriate that I do something with them for St. Patrick's Day. If I’m being completely honest, the mint Oreos are probably my least favorite. Although that’s relative. I mean, on a scale of 1-10 (10 being, complete and total weakness for), the mint variety would still rank 9. And their green quality is pretty much a given when it comes to St. Patrick’s Day. Don’t they look yummy? You can make as many or as few as you like, really. I made the entire box. Of course.